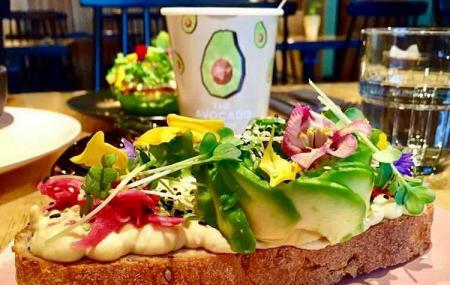 A unique and lively food place that is all set to charm its customers, natives and travelers alike; yes, the avocado themed restaurant is just as interesting as it sounds. Being the Europe’s first all-avocado restaurant, it is a treat to avocado lovers thanks to its vast range of avocado oriented dishes. The experimental nature has made it home to some of the very innovative and delectable dishes out there. All the food, when served warm by its friendly staff in a serene atmosphere, makes a dine memorable for a life time. If you are visiting Amsterdam with family, this is a place you must come to. The affordable food is totally hip and will leave your loved ones asking for more. First come first serve. No reservations. Prices depends on what you order. How popular is The Avocado Show? People normally also visit Amsterdam Canals while planning their trip to The Avocado Show. Great concept and service. Unfortunately we didn't find anything special with the food. It was decent food, don't get me wrong. But unfortunately nothing special enough to bring be back. Especially if you've to wait for a table, I'd rather go someplace else to enjoy my avocados and eggs. The food is okay and nice. It was beautiful. I did enjoy my time being here . However, I had a bit dissatisfied about the receptionist or the waiter. I totally understood the restaurant was busy.I didn't mind wait for the queue. It was my turn to get inside the restaurant. My husband just was in the toilet nearby and he was on the way back soon. The receptionist/waiter didn't allow me to get inside even the table was ready. He said there was a toilet inside. I explained to him and once I get inside I would make my order of the food immediately. Then he allowed me to get in. The attitude of him was a bit rude to me. While I sat down, he ingored me for the order and talked to others next to me.I just wanna have food a great time being here instead of bargain for anything. Overall, it is a nice place for the avocado lovers to come and try. Travelled across the world to check this place out. Great, healthy vegan food available. The place is small and always busy. The people vibe is great. The interior could look better. The restaurant is run by a few young teen-agers and their performance is very satisfactory. Their service is good and they are very polite. Food is good. Many varieties so you can choose what type of food you want to go with avocados. A small modern restaurant focused on food with Avocado (big surprise there). The food is not only good in taste, but also in presentation. Would recommend to come early and book a table, then use the waiting time on the nearby marked.